MARINA DEL REY — Sailors recently bitten by the racing bug — or those who would like to dip their toes into the hobby — are invited to sign up for the Homeport Regatta, May 3. The free event has been running for more than 40 years under the mission to encourage new racers to the sport. 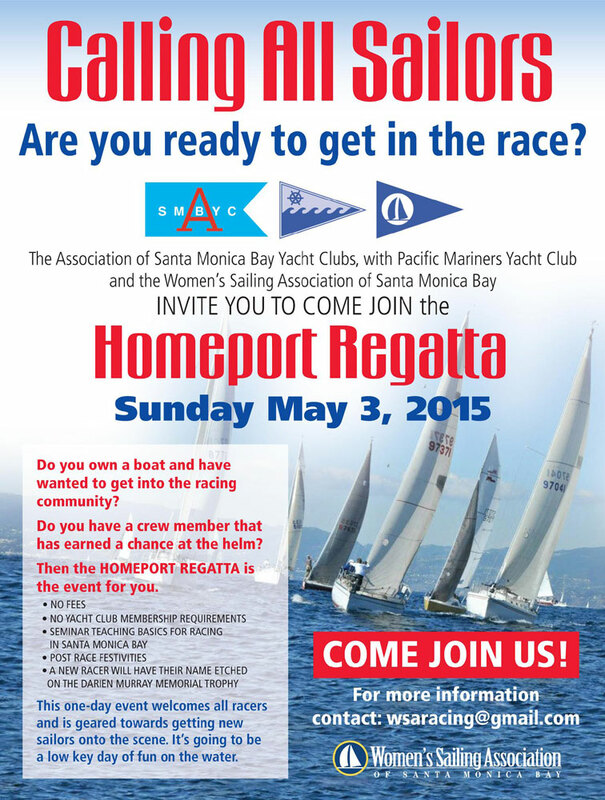 Advertised as the regatta that “has been turning boaters into racers,” the Homeport Regatta is co-sponsored by the Association of Santa Monica Bay Yacht Clubs (ASMBYC), Women’s Sailing Association of Santa Monica Bay (WSA SMB) and Pacific Mariners Yacht Club. The regatta is the perfect opportunity for sailors to break into the Marina del Rey racing scene. The event kicks off with an instructional seminar followed by a day of racing at no cost. Yacht club membership is not required. There are no PHRF rating requirements. All participants are invited to attend an instructional seminar at 6:30 p.m., Thursday, April 30 at Pacific Mariners Yacht Club, which will cover race planning and Santa Monica Bay’s “Chart 16.” Sunday, May 3, will be a day of racing followed by festivities, food and trophy presentations at Pacific Mariners YC. For more information and to register, visit regattanetwork.com/event/10105 or email wsaracing@gmail.com.